New exercise science proves you don’t need to spend hours in the gym to get in shape, by Travis Illian, Ph.D. Exercise can be a science and an art. But sometimes we just want someone to tell us what to do and how to do it. A recent article in the New York Times highlighted the fitness benefits of high-intensity interval training. The study, titled High-Intensity Circuit Training Using Body Weight: Maximum Results with Minimal Investment, published in the American College of Sports Medicine’s Health & Fitness journal, showed how interval training offered many of the same benefits as strength and endurance training, in a fraction of the time. 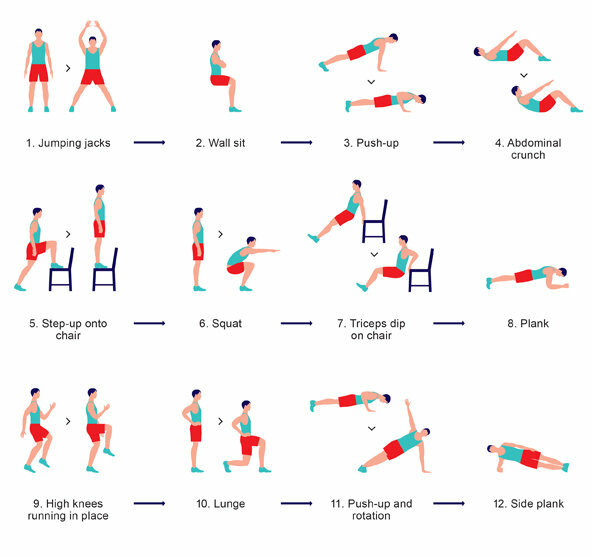 Everyone has a busy schedule and this workout was developed to be an efficient means of exercise to help busy individuals improve their health and recover from stress via exercise. Do you have 7 minutes to exercise? I hope so! If you are willing to take the challenge, use these 12 exercises – and all you need is your bodyweight, a chair, and a wall! See image below if you are not familiar with these movements. The exercises should be performed in rapid succession, allowing 30 seconds for each and the intensity should hover at about an 8 on a discomfort scale of 1 to 10. These seven minutes should be unpleasant. The upside is, after seven minutes, you’re done. Athough you are trying to work hard, always remember to focus on correct movement technique! Based on an individual’s fitness level, this circuit has shown to be an efficient means to help decrease body fat, improve insulin sensitivity, and improve muscular fitness. These are some great benefits for only 7 minutes of work! Challenge yourself to 7 minutes of full body intensity! Work hard! Work smart! And drink your Greens Plus! This entry was posted in Fitness, Fitness Tips, Health, Health Tips, Heart Health, Men's Health, Research Studies, Science, Weight Loss, Women's Health and tagged bodyweight exercise, Exercise, exercise at home, fitness, healthy, no machine exercise, quick exercise, short exercise, staying fit by Christopher Daniels. Bookmark the permalink.